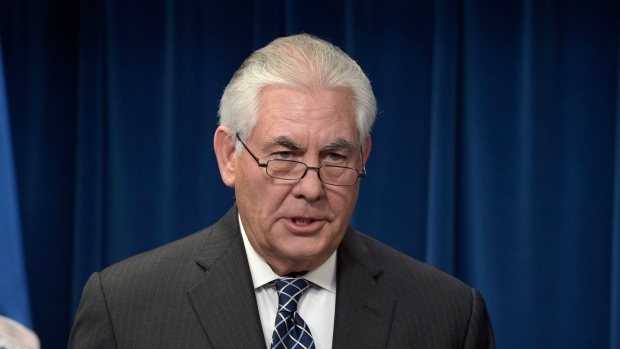 The United States will give more than $533 million in humanitarian aid for victims of conflicts and drought in Ethiopia, Somalia, South Sudan and the West and Central African countries bordering Lake Chad, US Secretary of State Rex Tillerson said. Tillerson made the announcement at a speech in Virginia before departing for a week-long trip to several African countries. The tour begins in Ethiopia where Tillerson is expected to meet government and African Union Commission officials in Addis Ababa. He will later visit Kenya, Nigeria, Chad and Djibouti. In a statement, the US State Department says Tillerson will discuss, among other things, counterterrorism, trade and investment. The top US diplomat’s first trip to Africa is seen as a good opportunity for the US to reaffirm ties with African nations after President Donald Trump referred to the continent and Haiti in a derogatory manner earlier this year. Tillerson’s visit also comes after the recent mass kidnapping of schoolgirls in Nigeria. State Department officials say finding ways to combat such incidents and promoting counterterrorism and security cooperation are high priorities for the top US diplomat. The United States recently put several affiliates of the Islamic State (IS) terror group in Africa on the terrorism blacklist in an effort to cut off their financial support from within the United States. Posted by Geraldine Boechat on March 7, 2018. Filed under Zoom. You can follow any responses to this entry through the RSS 2.0. Both comments and pings are currently closed.